The perfect amount of overcast... to keep us from frying! It was a lovely summer weekend. The weather was nice and we had a good combination of lazy and active. Friday Trav headed out for a national event being held at his old fraternity, which meant a girl's night for Gwen and I. After she got to sleep, it meant some nice quiet time for me! Saturday we had not plans, so it was a combination of errands, playing, and lazy movie watching! Sunday was the baseball game. Nothing says summer to me like Cape Cod or a trip to a baseball game! We headed up to the Lehigh Valley to catch the Iron Pigs (the Phillies Triple A affiliate team) vs. the Wilkes Barre/Scranton Railriders (where my grandparents used to live!) with my mom. The day started out a bit rough (I woke with a headache), but we left early for a leisurely drive up, then hit a dinner for some lunch before the game. It was warm, but the first half of the game had good cloud cover, which was nice. 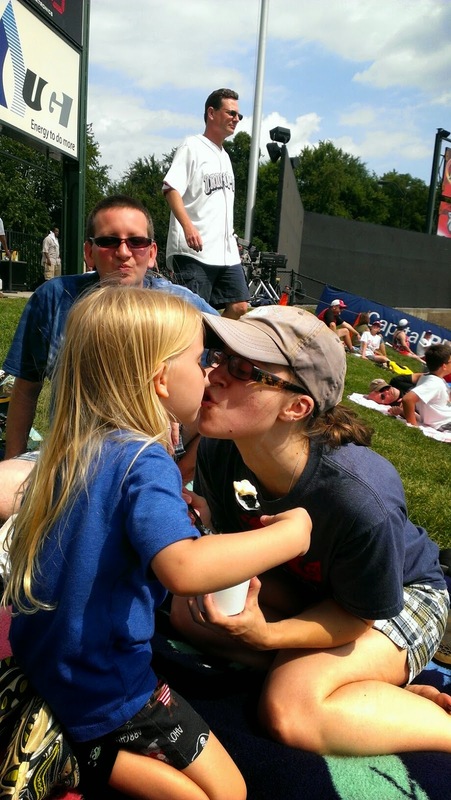 The second half of the game was hotter, but we cooled down by taking breaks in the shade, and enjoying some ice cream (and ice cream kisses!). We sat on the grass, like last time, which is the best choice since Gwen can entertain herself running up and down the hill. We get to see more game, and she gets to blow off some steam, and the whole day is a lot more enjoyable for everyone. Now its time for a short week, thanks to the 4th of July on Friday, and the day off I took on Thursday (my turn with Gwen!). We came up with some pretty fun last minute plans for the 4th weekend, but I'll tell you about them afterwards. How was your weekend? Any summer fun? Another day... another lost dog! Thankfully this one was only with us for a bit over an hour before the police located her owner. Normally mornings are not our favorite time of day. Most of the year, Trav and Gwen need to leave the house by 7a.m. to beat the traffic and get to work on time. Its early, we're all pretty tired, and always a little rushed. However their summer schedule is pretty wonderful. To save some money, Trav talked to his boss about coming in at 9 instead of 8 for the summer months, so we wouldn't need before care. That combine with the lessened traffic in the summer (plus being able to drive normal speed through what would normally be 3 school zones!) means that the drive takes a lot shorter time, and they don't have to leave until 8:15! What a difference!! I am working from home today, so this morning Gwen and I slept until 7 a.m., then had time to eat breakfast and goof off and play for a while before they had to leave. It was so relaxed and nice. You know, even though summer still means work for Trav and I, these changes (plus the days off) are really shaping up to make this summer feel like something different and special. You know, after you graduate, summer still brings excitement, but its just not the same. Gone are the days of laziness, a reprieve from the demands of school. Instead work is year round. We go on vacations, but there is no more 3 months of down time! Gwen doesn't really know the full joys of summer yet. She enjoys the warmer days and more outdoors time. She likes that they often break out water games at her school. But since she's not in elementary school yet, and goes to the same place for preschool as she goes for summer session, she doesn't have the full school year experience. That will change as she gets old and summer becomes a time for camp vs. the school year and homework. However, we're changing things up a little this summer to get a bit more of that feel to it. Gwen's daycare lets you sign up for whatever summer session weeks you want, and they can be 3- or 5-day weeks. So, we decided to do a bunch of 3-day weeks, with Trav and I taking turns on who spend those extra 2 days with her. This past week Trav had off on Friday and he took her to the Brandywine Zoo for the first time. Its smaller, but a nice place! Lots of cats and other creatures to view, but the big draw on the day they went was a bird show... they even had this adorable, tiny owl! Gwen's favorite was this bird that was raising money for the Audobon Society. You handed him the money, and he put it in the box! I have some ideas of my own. The Lehigh Valley Zoo, up near my parent's is a place I've been dying to get back to; as well as Linvilla Orchards and Longwood Gardens. Auntie Ro also has every other Friday off, so I'm sure we'll be heading over there once or twice. Gwen doesn't know what's ahead this summer, but I'm really looking forward to enjoying and experiencing it all with her! Oh, Hi! Sorry. I've been horrible lately about finding time to sit down and write. I'm behind here, I'm behind on emails. But I wanted to get something down, so here I am! Shall we just go with bullet points? Friday I wrote this before getting completely distracted and just closing the window. "So ironically, since I wrote earlier this week about how I wasn't ready for the heat, the weather has gone the complete other way and I'm wondering if I'm suddenly back in April since it has been continuously cool and rainy. Perfect weather for rereading Harry Potter, which I'm doing for the 10th? time? Maybe more? This weekend is supposed to buck up, weather wise, which is nice since Trav will be outside for tennis, and Gwen will certainly want to be outside as much as possible otherwise." The weather did buck up... and up and up and... Well, the window A/C units are in and I'm sweating my fool head off every time I go outside. We broke our record for highest low today. Oh June, you bipolar b!tch. Father's Day was this past weekend. It was low-key. Saturday Gwen and I headed to my parent's place and wished my Dad a Happy Father's Day. Sunday we let Trav sleep in, then I made biscuits and sausage gravy. Gwen gave him some things she made at daycare. He had tennis that afternoon, then we went out to get some ice cream. All in all, a nice weekend. I love how it is the simplest things that make kids happy... a drink bucket and a hose, and this girl was in heaven! Today is Gwen's last day of "school," she has off tomorrow and Friday, then summer session starts on Monday. Guess who completely forgot about those two days off until this week... oops! I think that's about it. Hopefully I'll have some news to share with you soon enough, for something I've been working on, but in the meantime, I'll try to be back sooner! Saturday Trav and Gwen headed to Home Depot for their monthly building workshop, while I slept in a bit. When they got home we headed across the bridge to hit up the Pop Shop (love that place!) where we ate too much food. We walked around the unfortunately ending farmers market, then checked out a new shop on the main street there to walk some of the food off. After that it was back home for some chores, and I headed out not too long afterwards to hit up Wanderlust Yoga in the City. I love the Wanderlust festival. I did it last year too. Its a great opportunity to try out a class with new to you teachers, and enjoy some yoga camaraderie. I invited some yoga friends this year, so that I didn't have to do it all alone again... though they headed out after one class and I stayed for another. I think two classes may have been a bit too much this year. It was HOT and the sun was strong, and even though I had a big bottle of water next to me and drank the whole thing, I think I still ended up a little dehydrated. I had a raging headache that evening, straight until morning. I did have a great time though, and Trav let me sleep in again on Sunday, which felt amazing. When I got up, Gwen ran to the store with me to pick up a few items. She was the sweetest! So helpful and calm. It was such a nice trip! We headed home and got ready for tennis. Trav taught while I kept an eye on Gwen and the neighbor's granddaughters. It was another hot one! I've been enjoying the 70s and even lower 80s that we've been having for the past month and a half or so, and I know that I was so eager for the warmer weather after the heinous winter we had... but I will admit, I just don't handle high 80s and up temps too well. I'm not looking forward to the onslaught of warmer weather that is upon us. Oh well. Its funny how how perfect your own shower feels, your own sheets, your own towels. Even if you like the ones you use while you're away, you'll notice the quirks that are different, and you'll miss your own. I happen to have the best shower head in the entire world, so I'm spoiled, but it is always the shower that gets me most when I'm somewhere else. I've been enjoying the little comforts of my house this week. May felt so hectic and full, not necessarily in a bad way, just very much; and the fact that it was capped with a trip away from home left me feeling like I'd been away for so much longer then I was. It made June feel like a return! I'm enjoying that feeling. This morning Gwen woke a little early, so I pulled her into bed with me. It was nice to have some quiet snuggly time with her, and that felt like a return too. My nights out at yoga, my occasional trips away, they are all healthy for us both and some needed me time; but coming back to my girl, feeling her weight in my arms and her laugh in my ear, that brings me back to my center. I miss her when we aren't together, and I find comfort in her proximity. Tomorrow night is her end of the year "concert" for daycare, and I cannot wait to see her up on stage singing and dancing her little heart out. June has arrived, and thankfully with it, some empty, lounge at home weekends! I'm so looking forward to those! In general, but also specifically after last week. Wednesday I drove up to Boston and Friday I drove home. It was too much, I think. In between, I visited with a girlfriend for coffee (Wednesday night). Then spent the night at my brother's apartment, where he and Elise made me Mongolian Beef, served me pie, and then put on some X-files. It was a good evening. We were all very proud of Elise! It was great to spend more time with her and my brother, as well as getting to meet her parents and sister. We went out for a late, long lunch with everyone to celebrate. I spent that night with my parents at their b&b rental. The next morning we were up early and off to brunch, before hitting the road. My drive was long and I hit so much traffic. I was so happy to pull up in front of my house an hour and a half after predicted. Saturday and Sunday were busy as well. Both days we were over at Ro and Pat's. Saturday for GG's dance recital, and Sunday for Casey's birthday party. Today I'm ready for a nap, but instead it was back to work, trying to catch up, and tonight, yoga! Hope your weekends were more relaxing then mine!